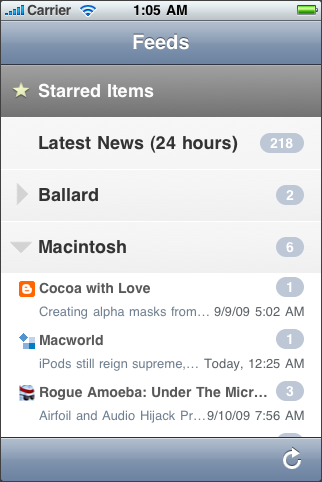 NetNewsWire for iPhone is a native application based on the award-winning RSS feed reader for Mac. NetNewsWire for iPhone provides you with a lightweight, easy application for keeping up with feeds on the go. RSS is the fastest and most efficient way to read your favorite news — and with NetNewsWire for iPhone you can access feeds wherever you are. It syncs with Google Reader, so your feeds appear everywhere, so you only have to read items once. You can share by posting links to Twitter or by sending email — without leaving the app. You can save articles for later in Instapaper or by starring them. The Next Unread button makes it easy to go through your news by tapping in one place. If you need more information please contact the developers of NetNewsWire for iPhone (NewsGator Technologies, Inc.), or check out their product website.